A recent upgrade to Avast's antivirus software (to version 11.1.2245) evidently included a highly undesirable feature: automatic injection of an advertisement for Avast as my email signature. The ad became visible to me only after I clicked the Send button. Below is a screenshot (with some personal details obscured) and the steps I took to shut this off. Yup. That's using Gmail, through a browser. So, in addition to the obnoxiousness of pushing a product, using my name and my personal email, without my consent, this also shows a fairly alarming amount abuse of access on the part of Avast to the inner workings of my computer. Anyway, I was able to turn this off through Avast's settings. Here's what I did. Right-click the Avast icon in the System Tray. A pop-up menu appears. 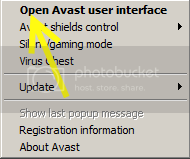 Left-click "Open Avast user interface." The interface window opens. Left-click the gear icon in the upper right corner. The settings window opens. 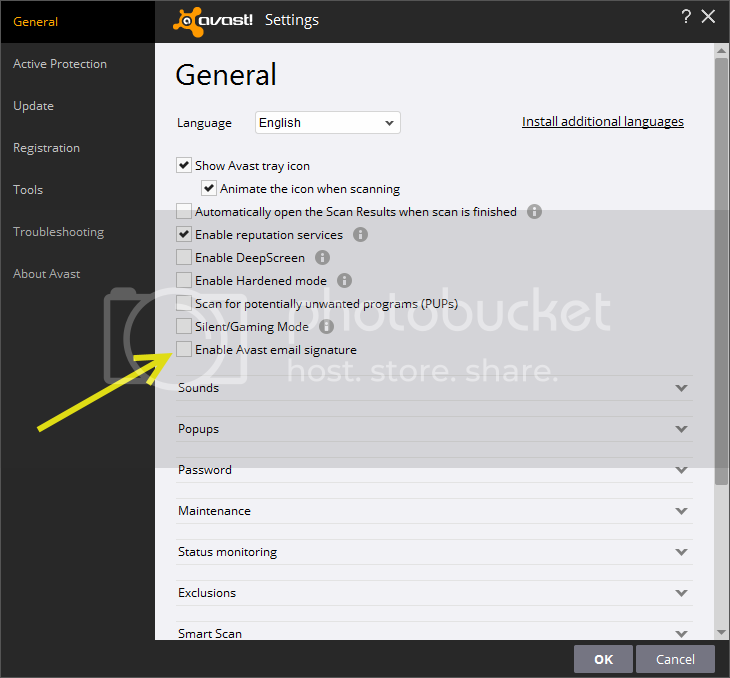 Uncheck the box labeled "Enable Avast email signature" and click the OK button at the bottom. The settings window closes. Close the Avast interface window by left-clicking the X in the upper right corner. Restart your browser (or your standalone email program, I'd imagine). Screenshots below. I'm running Windows 7, so things may look a little different if you're running something else. Please let me know about differences in the comments. Thanks. 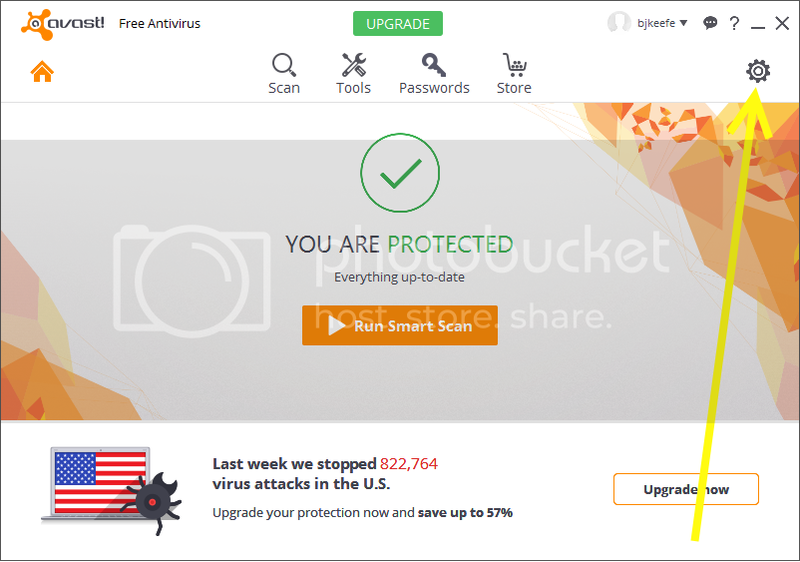 I was so tired of Avast's "please give us money for better protection" pop-up I uninstalled the free version. Yes. The non-stop stream of pop-ups is annoying. Worse, they're so misleading that I long ago stopped recommending Avast to anyone who is not a fairly savvy computer user. What did you install in its place? 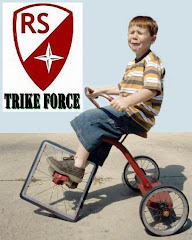 Or are you living on the edge, without an antivirus program? With this Avast has become Malware itself. You cannot call a company that without warning or permission installs ads in your communications as anything but Malware. Now we cannot trust Avast. Looking for an alternative. Avast should push an update that fixes this, apologizes, while they have any credibility left. Why did I even click that link?